Poker, Poker, Poker. If it has to do with poker I generally have a interest in it. I work as a Tournament Director for the WSOP and The WPT. 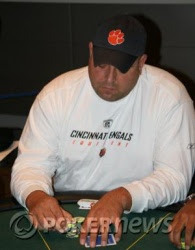 I play in as many poker tournaments as possibly. But most of all I have a love and passion for travel. If was granted one wish, it would be to travel the whole world with a understanding of language and culture. Poker has allowed me to follow my dreams with the freedom it brings. For all of you that have been around me since the first of the year, know how bad I have been running. Well guess what, it has not stopped. As most of you know I am here in Copenhagen. Anyway on to the tournament. I come out of the gate pretty strong, Im chipping up about 5% per half level. Until about the 2nd orbit after the first break. I limp in early with 9h 10h the button calls (chip leader) small blind calls bb calls. Flops is 3d 9c 10d, both blinds check, I check ( knowing that the button will bet) button bets $700 both blinds fold, I call hoping no diamond on the turn (pot control, something that is very important against the Scandies, they love to play big pots.). Turn is 2h, I check knowing the button will bet big or give me a free river, he bets $1200, I insta call, really putting him on a mid-queen flush draw. The river 9d, I insta check hoping he will bet, he goes into think mode for about 3 minutes then bets $1700. I act like im in the tank for about 5-7 minutes, I reraise another $3625 giving him value to pay me off, he does, he turned over the King high flush, He needed to get that fixed because I was full! That's right! So the rest of the time until dinner went by un-eventful. Shortly after the dinner break i built my stack to about 23,000 by playing small pots. We started with 230 players and I moved tables 5 times, no kidding, I don't mind moving, you meet alot of intresting people and gain more experience, I think. My second to last table, (I am so thankful I was only at this table for 2 orbits, all the big stacks were here, I mean monsters) I found myself facing a all-in for about 30% of my stack when I look down and find Ace King off from the button. I moved all-in to isolate, the blinds fold, but not happy. My opponent turns over 9h 10h. Flop comes 6c9d6d turn brick river brick. So I go from average stack to short stack, the table breaks 2 hands later ( I avoid the blinds, got lucky). I move to the final table of the night. I get to my new table a pick up 2 blinds and ante's of the first 3 hand I play, so I am feeling better. The Tournament Director (Thomas Kremser) announce's the final orbit of the night-7 hands at my table. I fold every one leading up to the LAST HAND OF THE NIGHT. Under the gun raises to $1800 (Who is a friend of mine, Arnaud, he won the EPT Prauge, and is a very small stack, $9000). The next to act asks Arnaud how much he has left and then makes it $8000, Im next to act. Not liking that he just counted my friend down, i act like i go in the tank, I have not even looked at my cards. i sit like this for about 2 minutes, then i start counting my chips and ask him how much he has, he has me way covered. I think a little more then decide to take a look down at my cards to see what I a going to muck, everyone thinks I am looking back at my cards, it is really the first time. Guess what I have, you got it!!! A dream, Pocket Fricking ACE"S with a rasie and a re-raise in front of me on the last hand of the night. I go all-in, everyone folds to the raiser's, the first raise lay's it down (Arnaud), the next player is priced into calling, it is only $4800 more for him to call. I turn over my Aces and he turns over a knife to my heart. Yeah, that's right, for the people who have been around me lately, you guy's (and girls), he had to have them , yep, TWO BLACK QUEENS!!!!!!!!! Flop comes Kd 7h Jd I feel good, that was alot of paint to dodge, but as Clint would say- I did it! Turn is 3c, so I stand up feeling really good. There is a huge crowd around my table, players, spectators, reporters, most tables are finished and have come to watch this last hand of the night. This would be great im thinking, a last hand of the night double+ up, I go from short stack to about $30,000 and some change, and im above chip average coming back on some rest. Yeah, Im doing that FOO SURE, FOO SURE. Well let me be the first to tell you, that aint happen!! How about the Qd on the river. "And the crowd goes wild". The room erupted, my hart sank, do you ever get that lump in your throat feeling, yeah, that one! I looked down, put on my coat, wrapped up my ipod, said "nice hand" and walked away. There went my dreams, a 2 outer!!! I am a person who has a passion for travel. I have found that working in the poker industry allows me the opportunity for this freedom. I have a B.S. from Wilmington College, a private college in the mid-west. I treasure many things in life, but none out-weigh my love for my mother and my beautiful daughter.